*I like to use a vanilla wafer crust for this, but you can use graham crackers or whatever you would like; homemade or store-bought. In a food processor, pulse vanilla wafers until they are coarse crumbs. You do not want a fine texture, but rather a coarse one, with larger pieces. (You do not have to use the entire box). Stir together crumbs and melted butter until blended. For the next step, I like to use the bottom of a juice glass, coated with cooking spray and I press the mixture onto the bottom and up the sides of a 9-inch pie plate, take it all the way to the top. Bake at 350 for about 10 minutes until lightly browned. Remove and let cool. Place sliced bananas on the bottom of cooled crust. In a saucepan, whisk sugar, flour, eggs, yolks and milk together. Cook over medium-low heat, whisking constantly, until it is thick like pudding; this will take about 10 to 12 minutes. Once it reaches this thickness, remove from heat and add vanilla and if using, banana extract. Pour into cooled crust. 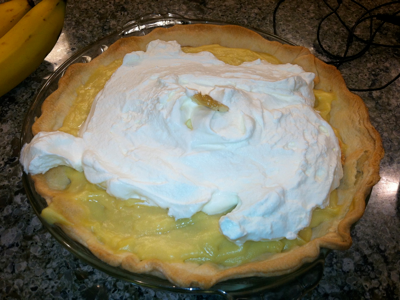 Refrigerate for 4 to 6 hours then top with homemade whipped cream and a banana slice in the center.